The Huawei Mate 10 Pro didn't have the smoothest US launch, partly because Huawei tried to stuff its Best Buy listing with fake reviews. 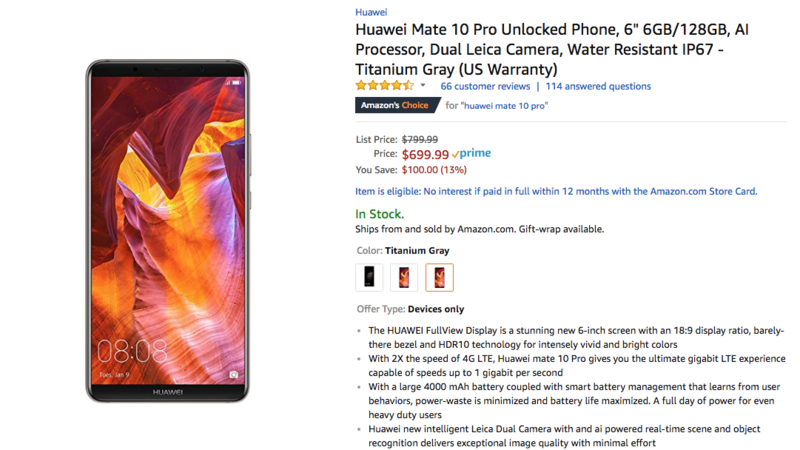 But before that mess emerged, Massdrop began offering the Mate 10 Pro at $699.99, $100 off MSRP. Amazon, B&H, and Best Buy are now matching that price. At its $800 MSRP, it would be surprising if the Mate 10 Pro didn't have top-notch specs. Luckily, it doesn't disappoint with its 6.0" 1080p OLED display, a Kirin 970, 6GB of RAM, 128GB of storage, dual 20MP and 12MP rear cameras, an 8MP selfie-shooter, and a 4,000mAh battery. The display is lower-res than the competition, but its 1080p resolution, along with the large power pack, make for great battery life. Amazon, B&H, and Best Buy are all offering the phone with the same $100 discount, but depending on where you live or how quickly you want the phone, all have their own benefits. Amazon provides free two-day shipping, but B&H doesn't charge tax unless you're in NY or NJ and offers store pickup from its Manhattan location. Best Buy also offers store pickup. Hit the source links below to grab a Mate 10 Pro of your very own. Motorola is more at risk of becoming irrelevant than ever - can it be saved?